Situated in the Southern Alps on the South Island it is the Adventure capital of New Zealand. Queenstown is a city set against the backdrop of the mountain range they call The Remarkables and that is exactly what they are. Queenstown, New Zealand is one beautiful town. 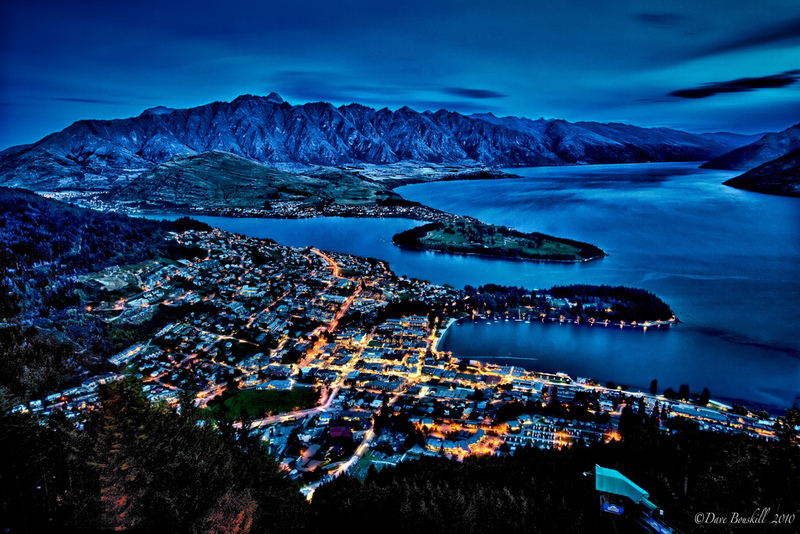 I wanted to shoot Queenstown at night mainly because of where it is situated. When the city lights up at night it is an amazing contrast against the mountain backdrop. I have not done a lot of night HDR work as I find it quite difficult controlling noise as well as ghosting but I wanted to give it a shot here. I have included one of the original images that I developed the HDR from so you can see the difference between the two. In my opinion the HDR shot gives a little more realistic view of what my eye saw at the time the image was taken. In both photos you can see the city looks about the same. The difference is in The Remarkables. In the HDR shot you see the contours and get a feel for what the mountains really look like. This is my first serious stab at the night HDR image and I would love to know what you think. Do you like the HDR image over the long exposure shot? If so what is your reasoning. Regardless I hope you enjoy both images this Sunday. Our Trip to New Zealand is sponsored by Flying Kiwi Adventure Tours and overland bus tour that stops in Queenstown for 2 days, but with it's hop on hop off options you can stay for 9 more days or as long as you like! 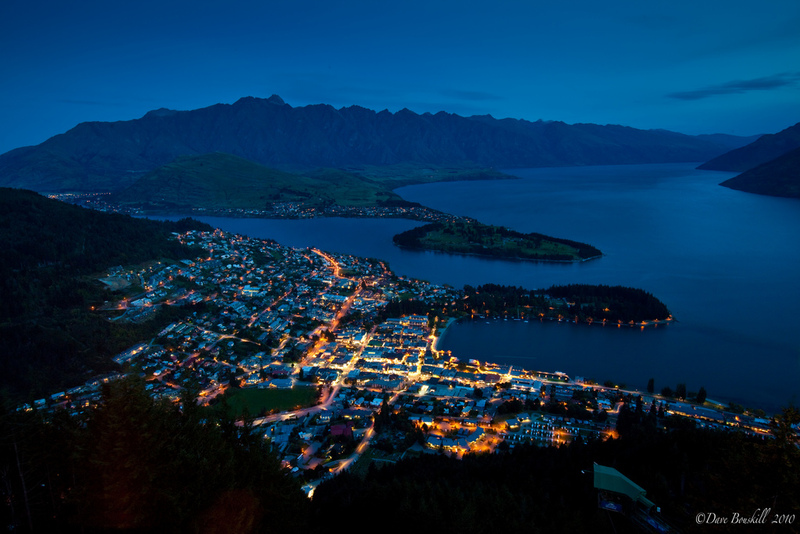 40 Responses to "Queenstown, New Zealand at Night"
I love the HDR because it seems to capture the magic of the colours a lot more than regular photos. On another note, Queenstown is one of my favourite places in the world. I haven’t been there since 2010 and I miss it. Thanks for sharing this beautiful picture! Good case study! I have to say I prefer the long exposure shot, as it looks more realistic to me. Then again, I’m nightblind, so I don’t really see much of anything at night, let alone the contours of mountains. 🙂 But in general, I find that HDR shots look like paintings to me, rather than photographs. They’re very artistic and can be quite beautiful in their own way, but tend not to look like reality to me. I feel like the more I attempt to ‘be a photographer’ the more I have to learn, but I guess that’s all part of the process. This is a beautiful shot! Thanks Annie. That is the great thing about photography, we are all constantly learning. Part of the fun is trying new things. Thanks Corinne. The two are quite different so it is always interesting to hear what people prefer. Wow! Beautiful photos of a lovely New Zealand location. Great work, thank you for sharing. Thanks! Queenstown is one beautiful place. Thanks for the comment. New Zealand is very easy to share. It is beautiful everywher. The HDR wins, hands-down! Amazing shot! Great work Dave!! We the love the HDR shot! Incredible! Thanks guys. I am enjoying shooting in HDR. Nicely done. I haven’t really messed with proper multi-shot HDR yet – only the software that will give an HDR-like appearance from one shot. What software did you use to do this in? I’d say it was an excellent first try! Personally, I like the detail in the HDR pic mountains, but I would prefer the overall image to be somewhere between the two – some HDRs can look a little too cartoonish for me, but this one is very close for my tastes. Hey Don, I used Photomatix. Thanks, I was shooting for somewhere more in the middle as well, but chose to increase the effect a little bit more to bring out the mountains. You are right, it is a fine balance. I love both of these photos… serious mad photo skills. Thanks Alouise. It has been fun experimenting and New Zealand’s landscape makes it so easy to be inspired to try new things and experiment. I am in the process of learning HDR and love your second photo. Really great job at capturing it without the noise– that’s so hard to do. Did you use 5 images? I’m hoping to go to New Zealand one day…just to spend days doing photography/writing. Love the dominance of blue here. Hi Charu. Yes, I used 5 images. I want to do a post where I show all 5 images. The Internet was too slow to upload all 5 but when we have more time and better Internet, I am going to show a shot with them all. Go for it, it’s not that hard, and adds a new element to taking your photos. I am LOVING the HDR shot. The Remarkables certainly live up to their name, don’t they? I agree Amanda, The Remarkables are Remarkable! You have managed to pull off a great night-time HDR image without noise, that’s impressive. I have done a lot of HDR photography and believe it can truly give a better representation of what our eyes see, when done properly. Thanks Mike. I did use noise reduction software which helped. But also shooting at 100 ISO helped as well. Cheers! LOVE IT! Great job Dave. Both shots are great but the top one is fantastic! I have been having the same problem w/ night HDR and you really nailed it. Do you remember your ISO? How many images did you use? Bethany, I shot at 100 ISO and used 5 images. “This is my first serious stab at the night HDR image” I’d say you hit it spot on! This picture is amazzzzing. The HDR is definitely better. The detail in the mountains. Wow I can’t say enough about it! Thanks Debbie. I want to reiterate, it’s not the first stab at HDR, just at HDR at night. I’ve been practicing a lot and slowly getting there. I think it’s very impressive for your first try! I love HDR photography but haven’t summoned the courage to try it myself. Thanks, but just to be clear it isn’t the first try at HDR, just HDR at Night. You should give it a try, the learning curve is quite fast, but you have to be willing to put in time. I personally like the HDR image. I agree that it gives a more realistic image of what you saw that evening. Great capture. Thanks Pete. It does give a more realistic image I agree. I think the HDR effect is a little much in this one. I think it’s easy to go ‘too far’ for my tastes though. Somewhere in between? Dustin, Yep, HDR isn’t for everyone. It can also be used subtly to enhance a photo, but I chose to go full on. Thanks Juno. Yes, HDR and the natural photography are quite different and also a matter of taste. It’s not for everyone. You’ve really captured all the eestsnials in this subject area, haven’t you? Oh, kodak moment! I remember this view. Ah, such a beautiful town.